There were only two hikers in our group, but the weather was great and there were other hikers on the trails. The deterioration of Scott's Cabin continues. Compare a picture taken during this hike with one taken in 1999. The signpost is still there, but the sign is missing. Most of the logs are missing, but other logs are lying around on the other side of the trail. Maybe they're going to rebuild the cabin! We took a wrong turn on Scott's Cabin Trail and had to backtrack for about a half mile, but we still returned to the parking area about 1:10 PM. According to Schad, we'll see a number of things, including the best views in the park, an old grave, and the remains of Scotty's cabin. Unfortunately, Scotty's cabin has almost completely disappeared, but the other things are still there. Sorry, dogs are not allowed on the trails in state parks. There is a user fee payable when you enter the park, so car pooling is recommended. There is a discount for seniors (62 or older). We'll start at the Doane Pond parking area (N 33 20.49 W 116 54.08). It's near the campgrounds. Just follow the signs. SUGGESTED ROUTE FROM SAN DIEGO: Take I-15 north and State Highway 76 east. Go about 20 miles, and turn north onto South Grade Road, also known as County Highway S6. 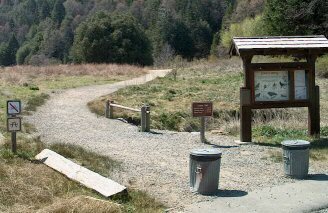 At the top of the mountain, turn left and then left again onto County Highway S7, which leads directly to Palomar Mountain State Park (Thomas 409 G6). Follow the signs to Doane Pond, and park in the day use parking lot near the pond. The distance from San Diego is 85 miles and the estimated driving time is two hours. The nominal starting time is 10:00 AM. The hike leader will be at the parking area by 9:30, and at 10:15 we will hit the trail. Wear good hiking shoes and suitable layered clothing and take water, lunch, and sun protection. Take a camera if you wish. You may want to call 858-675-8706 for the latest weather information. Heavy rain will cancel the hike.